Paper is a simple material. It is essentially a mat held together by a fiber’s rough­ness, and can be made from almost any fibrous material such as cotton, hemp, flax, wood or recycled paper. And yet, this simple product has a tremendous effect on our lives. Imagine how different your day would be without paper! We use paper for countless things in our everyday lives, including newsprint, magazines, schoolbooks, photocopies, computer printers, envelopes, stamps, tissue and sanitary products, bags, boxes, containers, food packaging, gift wrap, wallpaper, disposable dishes, lamp­shades, and as an art medium. Industrial uses include gaskets, speaker cones, liquid and gas filters, insulation, and fric­tion devices. The process for making paper was invented in China in the second cen­tury A.D., and all paper was made one sheet at a time until 1798. With the Industrial Revolution and the papermak­ing machine, papermaking became a major industry that provides countless products, from books and newspapers to packaging and note pads. Some modern machines can make a sheet of paper 26 feet (8.8 m) wide and nearly 40 miles (64 km) long in just one hour! While the tech­nology has changed dramatically over the centuries, the basic steps are simple enough for your students to do in class. The process begins when trees, grown especially for papermaking, are harvested and transported to a paper mill. At the mill, large machines strip away bark and shred the logs into millions of chips the size of breakfast cereal. The wood chips travel on conveyors to gigantic “pulp cookers,” where chemicals and steam are added. The mixture is heated and pres­surized, breaking the chips into smaller and smaller pieces and finally forming a dilute water suspension of wood fibers called pulp. The pulp then passes through cleaners and screens and sometimes goes through a bleaching process that will give it the whiteness needed for the grade of paper being manufactured. Other chemi­cals such as dyes, pigments, sizings, or resins are sometimes added to provide the paper or paperboard (thick paper for boxes) with the appropriate finish. The pulp is then pumped through pipes to a paper machine where it is sprayed onto a wide, moving wire screen. After the water in the pulp drains through the holes, a damp mat of wood fibers remains; this is the paper. It is picked up from the end of the moving belt and dried over steam-heated rollers. Most paper comes from trees, a renew­able resource. Most of the trees used for paper are managed for that pur­pose. In commercial papermaking, more than half of the fiber comes from lumber mill residues and from paper that has been collected for recycling. Paper is easily recycled, which helps reduce waste. However, no matter how much paper we recycle, new trees still will be needed for paper products, because paper cannot be recycled indefinitely. Each time paper goes through the manufacturing process, the fibers deteriorate. After repeated recycling, the fiber is no longer suitable for papermaking. Producing recycled paper requires about 40% less energy than produc­ing non-recycled paper. And making recycled paper produces 70% less water pollution and much less air pollutants, such as greenhouse gasses, particulates, and other hazardous pollutants. Introduce the activity by asking stu­dents what they think paper is made of and how it is made. Fill the blender halfway with warm water, then add a hand­ful of the soaked paper. Blend at medium speed until you no longer see pieces of paper, and the pulp has a soupy consistency. You can blend in a piece of construction paper for color; or stir in short piec­es of thread, dried flowers, or herbs for texture. Pour the mixture into the large basin and then fill the basin with warm water, mixing thoroughly until the ingredients are evenly dispersed. Adding a few ounces of liquid starch will help make the paper firm. Slide the deckle into the basin. Put some pulp onto the screen and, still holding the deckle underwater, gently move it back and forth to get an even layer of fibers on the screen. Lift the deckle out of the mixture, keeping it flat. Allow it to drip until most of the water has drained off. You should have a uniform layer of pulp mixture on the deckle. Press the pulp gently with your hand to squeeze out excess moisture (rubber gloves will help). Soak up any excess water from the bottom of the screen with a sponge. Place newspaper on a flat surface and turn the screen paper-side-down on the cloth. Lift the screen gently, leav­ing the paper. Gently tap the screen to help release the paper. Let it dry naturally for several hours or overnight. Gently peel off the paper when it is dry. When you’re finished making paper, collect the leftover pulp in a strainer and recycle it, or freeze it in a plastic bag for future use. Don’t pour the pulp down the drain! 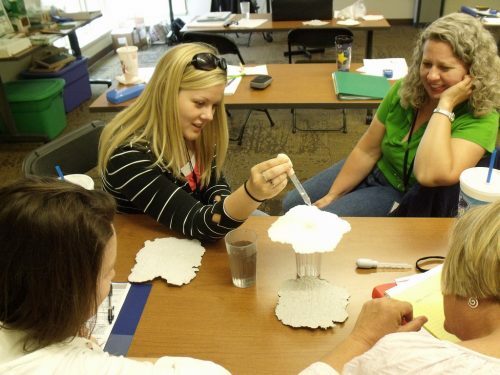 A group of teachers tests the recycled paper they have made. What materials did we use in making paper? What did we do with the waste products? What would it be like in a paper mill, where tons of paper are being made a day? Why do you think recycling paper is important? What about reducing the amount of paper you use? How is the new paper different from the old paper that you recycled? This is just a small part of this lesson, to review the remainder of this lesson download the full activity. 96 multi-disciplinary, minds-on activities designed for specific grade levels and learning objectives, and correlated to national and state standards. Reading connections to relevant fiction and non-fiction books stretch your students’ imagination, knowledge, and vocabulary. Technology connections expose students to software applications, imaging tools, and Internet resources. Differentiated Instruction techniques reach students with varying needs and talents. Over half the activities take students outdoors. Assessment opportunities are closely aligned with clear objectives. Activities are grouped by theme and storyline. Most require few special supplies or extra preparation. For additional resources that strengthen and enhance this lesson, register (for free!) and log in to access them. Our lesson plans for all grade levels are fun, flexible, and easy to use. Each includes background for teachers and student assessment tools.